Compressed air quality classes exist that define the acceptable levels of moisture and contaminants in compressed air. However, in spite of all the available information, the majority of industrial systems fail to achieve the desired air quality level, because end users fail to engineer the installation. The lack of space, capital limitations and the compressed air industry’s focus on equipment rather than on the systems approach promoted in the Compressed Air Challenge’s materials and seminars are all contributing factors. This article will focus on moisture, which is the most common air quality problem in industrial plants. There are four phases in the moisture removal process, the first three of which must function properly; otherwise, moisture will show up in the system. In the first, or condensation phase, aftercoolers, piping, wet header receivers and dryers cool the saturated air, resulting in moisture and oil vapor condensation. In the second or collection phase, low points in the piping, receivers, water separators and filters collect the condensate. In the third or removal phase, drains remove the condensate from the collection points. In the fourth or disposal phase, condensate is disposed of in accordance with local, state and federal regulations. 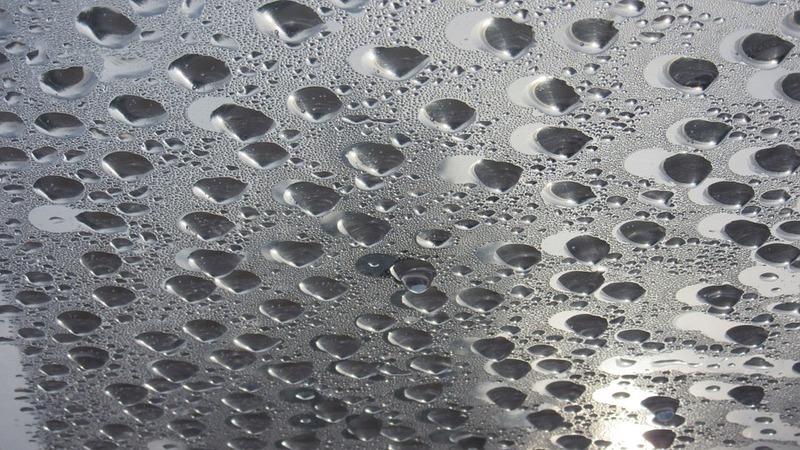 This article will focus on the condensation phase and to keep it simple, the discussion will be limited to those factors that affect the performance of a refrigerated dryer, which is the most common dryer found in industrial plants. Refrigerated dryers cool a specified mass flow, stated in scfm, to a temperature slightly above freezing. This temperature is normally 35-39°F. The dryer nameplate’s mass flow rating (scfm) is based upon the three 100’s – 100°F inlet and ambient temperatures and a 100 psig inlet pressure. The dryer’s ability to consistently cool the air to its setpoint is dependent upon its turndown capability, ambient temperature, inlet temperature, inlet pressure and controlling the velocity and mass flow through the dryer. Dryer Turndown – The manufacturer’s selection of the hot gas bypass determines the turndown capability of a non-cycling refrigerated dryer. The dewpoint of the air will begin to rise and freeze-ups can occur when the mass flow falls below the turndown capability of the hot gas bypass valve. Dryer Capacity – Dryers must be sized based upon the highest airflow, highest temperature and the lowest pressure. Figure 1, shows that at the rated flow (scfm), the dryer’s capacity reduces when the inlet or ambient temperatures (assuming dryer is air-cooled) increase and/or the inlet pressure decreases. The graph in figure 1 shows, that the inlet temperature has the largest impact on dryer capacity, followed by ambient temperature and then inlet pressure. Therefore, we will look at these variables in that order. – Temperature drop in the piping and wet header – 5F receiver(s) located prior to the dryer inlet. In order to protect system components and end use equipment an aftercooler is used to lower the compressor discharge air temperature. Aftercoolers are selected based upon specified pressure drops and their ability to cool the compressed air to within a specified temperature rise above the temperature of the cooling medium. The temperature rise is called the “approach temperature” or “cold temperature differential” (CTD). The cooling medium used to cool the compressed air is either, a water/glycol mixture, water or air. For air-cooled compressors the highest cooling medium temperature is normally based upon the outside ambient temperature. However, in reality, the highest cooling medium temperature must be based upon the actual rise above ambient, which is determined by the conditions found in the room where the compressor is operating. In a poorly ventilated area the rise above ambient approaches 40F, while a well ventilated room is designed for a 5F rise above ambient. The compressor package discharge temperature will vary between brands based upon the aftercooler cold temperature differential (CTD) selected by the manufacturer. In addition, the aftercooler CTD will vary based upon inlet humidity. Therefore, clean aftercooler cold temperature differentials are found to be between 10-30F. The aftercooler CTD will also increase as the cooler fouls. In addition, some compressor package designs require that the enclosure doors remain closed to ensure airflow across the aftercooler; however, invariably what happens is that as soon as the compressor operating temperature approaches the high temperature shutdown setpoint the operator opens enclosure doors. This reduces the cooling airflow across the aftercooler resulting in an excessive compressor discharge air temperature. Unless a high temperature refrigerated air dryer is installed, an additional water-cooled heat exchanger is required if the temperature of the compressed air at the dryer inlet can exceed 120°F. Compressor Installation Considerations – As seen above air-cooled compressors make the dryer inlet temperature more difficult to control. This is because so many factors affect the air-cooled compressor’s discharge temperature. The failure to account for these factors in the initial system design, equipment selection and installation is one reason that so many plants operating air-cooled compressors have moisture in their system. Most industrial plant personnel install air-cooled compressors knowing little of the critical data required for a successful installation. When asked about ventilation design criteria the plant personnel’s response is almost without exception the same, “What design criteria”? However, thanks to the efforts of the members of the Compressed Air Challenge and its eager seminar attendees things are changing. The day is approaching that when asked the response will be, “The duct was sized based on the cooling fan’s rated cfm and the maximum allowable additional static pressure rise as shown in the manufacturer’s data sheet. After completing the duct installation we had an independent air balancing company test it. We smoked the room to verify that we have good airflow patterns and during the summer, the temperature in the compressor room stabilizes within our temperature rise design parameter. Yes, we installed filters on the room intake louvers and the compressor cooling air intake to minimize cooler fouling. However, we increased the room louver area and installed an intake filter box on the compressor along with differential gauges that let us know when the filters should be changed”. Compressor location will determine the minimum cooling air temperature possible. Some locations may be air-conditioned, while in others such as outdoor locations in the California deserts have ambient temperatures that reach 127°F. As the term “minimum” implies the cooling air temperature is subject to increases caused by poor ventilation, and poor airflow patterns. Static pressure rise across the cooling fan – This is the discharge pressure of the fan minus the inlet pressure. The discharge pressure is called backpressure. The manufacturer’s engineering data sheet and/or the operation and maintenance manual give the maximum allowable additional static pressure rise across the fan. Exhaust duct, louvers and cooler fouling increase the backpressure on the fan. Inlet duct, restricting airflow into the room and inlet filters can create a negative inlet pressure. External cooler fouling reduces the heat exchange rate and decreases the cooling airflow by increasing the static pressure rise across the fan. Poor airflow patterns create dead air spaces where the temperature is elevated and/or result in equipment downstream operating hotter because the hot cooling air exhaust off one machine becomes the inlet cooling air for the other. Poor Ventilation has some obvious signs, which include high compressor operating temperature, a high compressor room temperature and, in some cases, a negative room pressure. Negative pressure – There are many reasons for avoiding a negative room pressure. First, operating a compressor in a negative pressure is like operating the compressor at a higher elevation, reducing the mass of the cooling air resulting in an elevated aftercooler discharge temperature. Secondly, the reduction in the mass of the room air also reduces the capacity of the compressor. Thirdly, negative pressure increases the static pressure rise across the cooling fan reducing the capacity of the cooling fan. Common causes of negative pressure are an undersized cooling air intake duct or undersized room intake louvers, gravity operated louvers, insufficient makeup air and intake filters. Intake filters are located on room louvers, compressor enclosures or in the intake duct. For the first 10°F above a 100°F ambient temperature, the capacity of an air cooled dryer is reduced 10%. The location of the dryer is important because the maximum allowable static pressure rise across the dryer cooling fan(s) is zero inches water gauge and the maximum ambient temperature for an air-cooled dryer is normally 110°F. Therefore, locate the dryer in good airflow patterns because the cooling air exhaust cannot be ducted away. Prevent backpressure on the exhaust fans by orienting the dryer so that the cooling air exhausts in the same direction as the airflow or prevailing winds and do not direct the cooling air exhaust into a wall. With the dryer cooling air exhausting into the equipment room, there must be enough ventilation to prevent heat buildup. Use a water-cooled dryer when ambient temperature exceeds 110°F. For every 10-psi reduction in pressure below the dryer’s 100 psig rating the capacity of the dryer is reduced 4 %. The dryer inlet pressure is affected by system demand, control setpoints, control signal location, and losses in the piping and filters located upstream of the dryer. System Demand – The dryer inlet pressure will decrease when the system demand exceeds the compressor capacity. Control Setpoints – When the compressor control setpoints are cascaded, the inlet pressure to a common dryer will fall as each compressor loads. Today automation systems can efficiently operate multiple compressors in a narrow pressure band. Control Signal Location – The respective pressure differentials of a compressor’s aftercooler and/or water separator lower the dryer inlet pressure, if the control signal location is upstream of these components. Piping – Undersized piping will lower the pressure at the dryer inlet. Size the compressor discharge piping and header for velocity of not more than 20 ft/sec. Filters – Coalescing filters will normally lower the dryer inlet pressure 2-3 psi when clean and higher as they become fouled. Size the filters based upon their wet differential at the lowest inlet pressure. If an air receiver is installed upstream of a dryer, system events may exist that can result in the flow through the dryer exceeding the dryer’s rated capacity. These surges increase the air velocity through the dryer, which reduces contact time and can re-entrain moisture into the air stream resulting in a higher dew point and/or moisture in the system. Therefore, if large enough system events exist to surge the dryer and it is determined that a receiver must be installed upstream of the dryer then another receiver equal to or larger than the one upstream must be installed downstream of the dryer. Hopefully, the above discussion has shown that to prevent or eliminate moisture from occurring in a compressed air system it is important to design the system and equipment installation to control the cooling medium temperature and mass flow rate and compressed air pressure, temperature and flow rates. In order to properly engineer the system and equipment installation one must request the equipment manufacturer’s engineering data sheets. Moisture free system designs can incorporate any brand equipment; however, once designed, purchasing equipment based upon the lowest bid can defeat the best design. Therefore, the specifications must include the performance data used to design the system and the performance data for the low bidder’s equipment must accompany the proposal to ensure that it meets the system design criteria. Chris Beals is a compressed air system auditor who has audited in excess of 600 plants throughout North America. Mr. Beals works with several national accounts that rely upon his expertise in designing compressed air systems for new plants, retrofitting existing systems and the evaluation and design of air operated production equipment. Mr. Beals is a founding member of the Compressed Air Challenge, a Compressed Air Challenge instructor, a member of the Compressed Air Challenge Core Technical Group and a past member of the Compressed Air Challenge Project Development Committee where he represented over 600 compressed air distributors. Mr. Beals is also an AFE member and he is pleased to answer your questions. He can be reached at cbeals@izsystems.com or 303-771-4839.